This is a fairly cheap DIY pedal board with a lid. It works well but can definitely be improved upon. I used standard 9 mm plywood from Wickes. I highly recommend using better quality if you can get it. This cheap stuff can have holes between the layers quite often, which makes it difficult to work with not to mention the extra filling needed. There are 4 sides to cut for the lid, a top for the lid and 2 pieces for the base. Obviously dimensions will be to suit your own requirements. I packed out the brackets to accommodate the length of screws I had handy at the time. This is an optional bodge. The base is made of 2 parts, the 'live area' and the slightly larger lower base piece. The live area is where the pedals will go and the lower area steps out on all sides to serve as a bed for the lid. First I cut the live area to give me a template to make an accurate lid to. Then I cut both long edges of the lid to the same dimension as the long edges of the live area. These were then glued to the box lid (which is an exact copy of the live area) using the live area as a support to ensure the sides stayed at 90 degrees. i also pre-fitted the plastic and metal angle brackets. After drying, I then measured and cut the sides to ensure an exact fit and then glued them in place. With the lid complete, it can now be used as a template to make an accurate lower base from. You can either draw round the outside of the lid or take measurements and draw it out, either will work fine. Once cut, the live area and lower base can be glued together. To try and get the best registration of the 2, I placed the live area on top of the lower base then put the lid over the live area and adjusted until the outer edges of the lid and lower base were flush all round. After carefully taking the lid off I marked the live are position on the lower base then glued them together. This concludes the base and lid, although sanding is still required. Now is the time to sand all surfaces to get the best finish possible and also slightly round off all edges and corners. I then added the handle (from an old amp cab) and catches. Please use better quality than I did. Now remove the hardware and apply a finish. I used japlac. Very good and hard wearing but very unforgiving - make sure to sand to a high standard before using it! Now refit the hardware and add corner protectors and feet. I used the corner protectors from IKEA which are for meant for use on furniture to help protect children bumping their heads on sharp corners. They double as feet too and are non slip. And I already had them handy. As can be seen from the pic, I had to gaffa tape one on after it broke off, taking some plywood with it. The only real problem with this board is the choice of catches. As they had to be mounted upside down to the way they were intended, it's fiddly trying to get the lid back on, so best to find a better solution than I did. After all that, all that's left to do is add the Velcro and pedals. Then rock like a righteous warrior of metal (optional). Pretty elaborate. I made myself a pedal board many years ago and I just took 2 pieces of plywood and separated them with some scraps of wood. I ran power wires for each effect in the cavity between the pieces of plywood. 9 volt battery clips come up out of strategically positioned holes in the top board to power each effect. They are all hooked up to a single 9 volt supply. 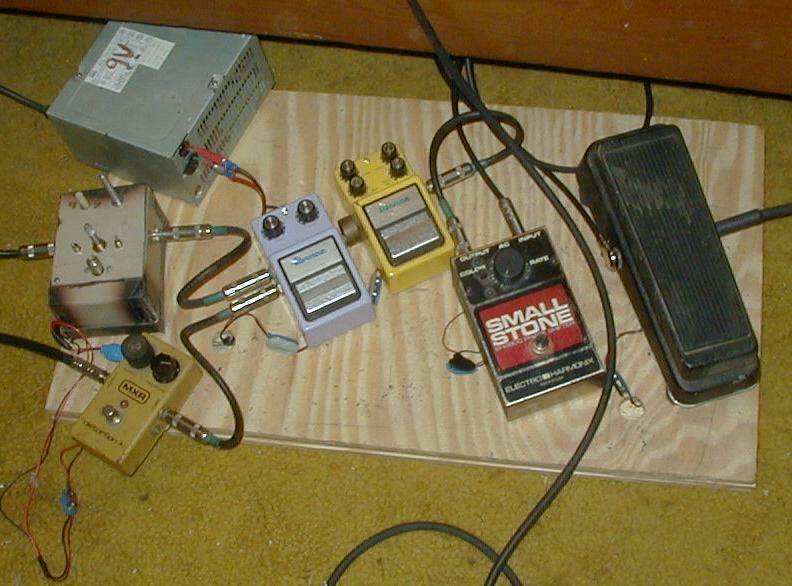 I think you should call your project a pedal box because it looks like a lot more than just a board to me. Very rare for me to be accused of being elaborate! I think you're right, the name needs changing to be a bit more descriptive. My next board will actually be very similar to yours but I'll be putting the power supply inside and wiring it up so you plug the guitar into the board and then there'll be an output to the amp from the board. Basically ripping off a Rebel Board, which I found from another rebel board inspired instructable. Some of my best projects are copies of things I've seen. Good luck with your next project. My PSU sits on top with the rest of the effects. I built it into an old computer PSU case. I suppose I could have made it smaller. A board sandwich I suppose. Cool, love the home made power supply and the fact the pedals have seen some action! The MXR distortion is meant to be top banana, will have to try one out. I took that to a music store once and let the store owner play it, when he was done he looked at me with a far away stare and just said, how much do you want for it? He was obviously pretty impressed. I believe it is the ultimate overdrive ever made. I even built mine with a vintage JRC 4458D which does make it extra sweet. 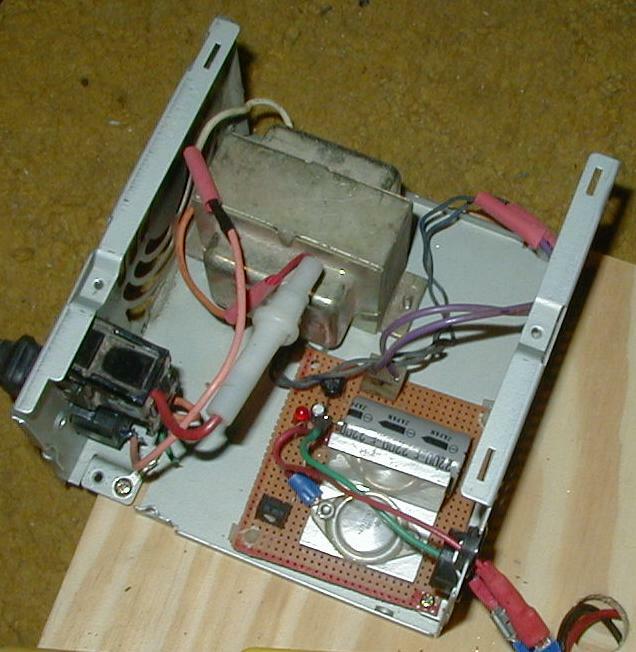 I hit the jackpot stripping some old Japanese radio that was loaded with vintage JRC ICs. If you're really looking for the tone then getting a genuine vintage JRC 4558D might be worth it. Although I think a lot of chips being passed off as vintage today aren't. I know mine are because I pulled them out of vintage equipment. I've played my vintage JRC against other op amps and I have to say there is definitely something to it. Vintage JRCs are fuller and richer than other chips I've tried them against. I mean it is noticeable. I'm not usually one to go in for a lot of audio pooh pooh either. As far as I'm concerned most of it is bunk. But vintage JRCs I believe in! Thanks, will take a serious look at that, want to be build my own boost and overdrive at some point. Useless at electronics though! Useless at electronics? A project completely designed does not require extensive knowledge of electronics theories. It is basically paint by numbers. You just have to go through the motions. Start out by etching the board. If you can get the board etched then the rest of it is very straightforward. Etching can be a little tricky until you've learned some of the tricks. I designed the board very simple so the crudest of techniques works for making it. I used the toner transfer method myself. Someone careful could probably use rub on mask to make the board too. Maybe even a Sharpie marker? Blank copper clad board is pretty cheap material and etching is such a valuable skill to master that it is probably something worthwhile for people with a passing interest to learn. 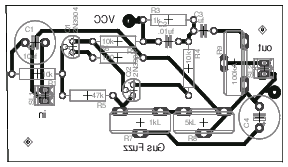 I built a fuzz effect once that is really simple and it would be a good project to start off with. There are probably even articles on this site about building similar. Get that under your belt and you'd be ready to tackle the GM Arts Overdrive.